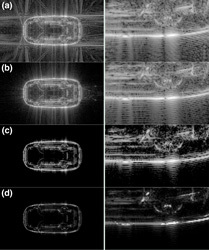 Graduate student Victor Churchill presented the poster Edge-Adaptive $\ell_2$ Regularization Image Reconstruction from Vehicle SAR Data at the AFOSR Annual EM Contractor Review. Victor does research on image reconstruction methods with Professor Anne Gelb. 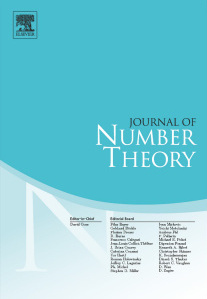 Jared Duker Lichtman '18 and Professor Emeritus Carl Pomerance co-authored the paper Explicit estimates for the distribution of numbers free of large prime factors , recently published in the Journal of Number Theory . 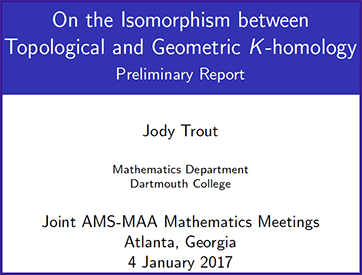 Professor Jody Trout gave a talk at the 2017 Joint Mathematics Meetings in Atlanta on research he is doing in K-homology that is related to the mathematics of string theory. 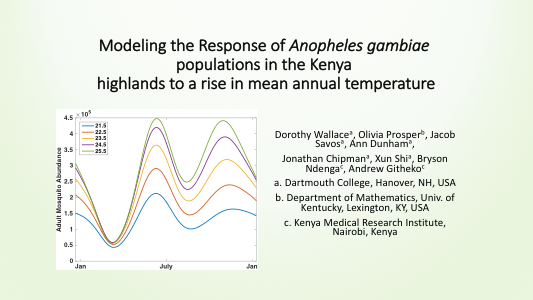 Professor Dorothy Wallace gave a talk at the Joint Mathematics Meetings 2017 in Atlanta on the consequences of rising temperatures for malaria vector abundance. Her work is joint with several authors, two of which are Dartmouth undergraduates Jacob Savos and Ann Dunham. 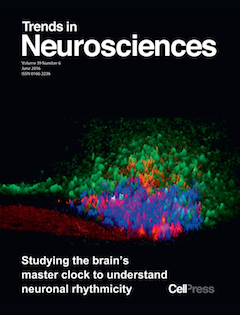 Professor Scott Pauls' paper Deconstructing Circadian Rhythmicity with Models and Manipulations is featured on the cover of Trends In Neurosciences . 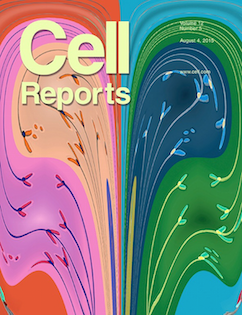 Professor Sergi Elizalde co-authored the paper Dynamics of Tumor Heterogeneity Derived from Clonal Karyotypic Evolution with two biologists from the Sloan Kettering Cancer Center and with former Dartmouth math grad student Giulio Genovese. 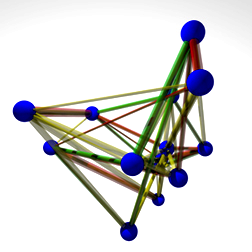 The ICERM Semester Program on Computational Aspects of the Langlands Program took place in 2015. Professor John Voight was on the organizing committee. Professor Pete Winkler co-organized the semester program "Phase Transitions and Emergent Properties" at ICERM at Brown in 2015. The program included workshops on complex networks and quasicrystals, the onset of emergence as small systems grow, and the emergence of structure and shape as limits in probabilistic models. The workshops drew together researchers in combinatorics and probability as well as statistical physics and related areas. With a strong history of research in pure mathematics and fast-growing activity in applied mathematics, our department represents the major fields within mathematics through our research groups. Faculty members have research interests not only in the major areas of pure mathematics, but also in applications of mathematics to the physical, biological, and social sciences. Most of these groups hold weekly seminars for faculty and graduate students during the Fall, Winter, and Spring terms. Our seminars page has an overview and our daily events calendar contains the most up-to-date information. In addition, our active colloquium program brings in visiting faculty to enrich and expand academic discourse and also provides for welcoming social interaction through our weekly teas. In Kemeny Hall our graduate students work alongside faculty in a friendly and supportive environment in a beautiful building with well-appointed facilities. The accessibility of faculty members ensures a great deal of out-of-class interaction between faculty and graduate students. See recent theses and the list of recent graduates to explore areas of graduate research. Undergraduates in pursuit of a senior thesis work closely with faculty advisors on independent research projects. We also foster undergraduate research through our Dartmouth Mathematics REU as well as the Byrne Scholars Program.